The Martin Yale CDS200 CD Slitter / Perforator saves time and money. Martin Yale CDS200 CD Slitter / Perforator helps create your own CD case liners. TheCDS200 CD tray liner slitter can handle 8 inch by 11-inch size paper. Paper is simply run through the machine a couple of times to create the final product. This allows you to create your own in-house CDs that look professional. We have a low-price guarantee on all our paper perforators and slitters. Please be aware that the CDS200 will not work with glossy paper. 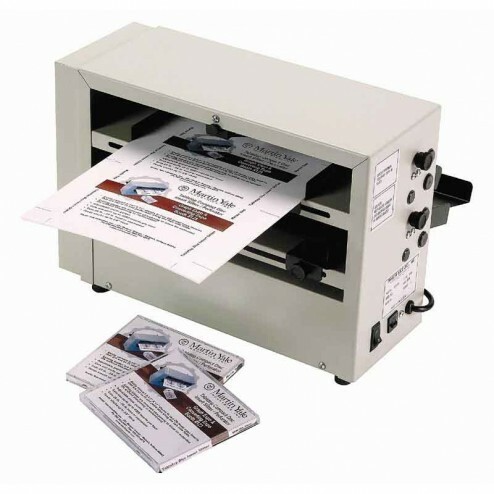 CDS200 Insert CD Slitter Perfect for businesses, quick print shops, training and marketing departments. Perforated along side folds for easy insertion into jewel case. Easily convert 8.5 x 11 sheets into (2) CD jewel case inserts. Semi self-sharpening blades to allow for extended operation before service. Handles 24# Bond stock or equivalent. Adjustable paper guides for quick and easy registration.